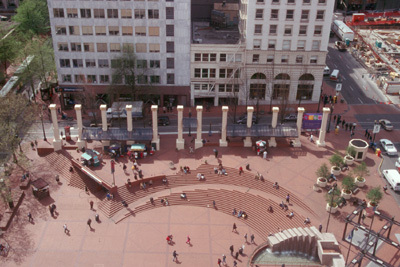 Pioneer Courthouse Square is one of the first in a new generation of public squares. No longer just passive green spaces, these squares are designed to be programmed and used by the public. In fact, the infrastructure for such uses is built-in, and the spaces have management entities in charge of them to assure their ongoing effective use. 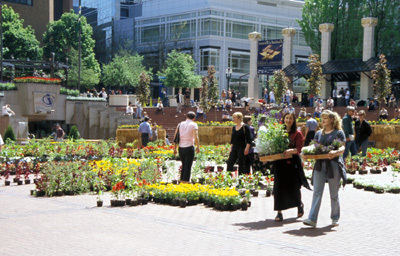 The process of creating Pioneer Courthouse Square - the public debates, the fundraising, the grand opening - was designed to involve Portland's residents. Funding and vision from the city's transit agency, Tri-Met, linked people to the square and downtown as a whole. 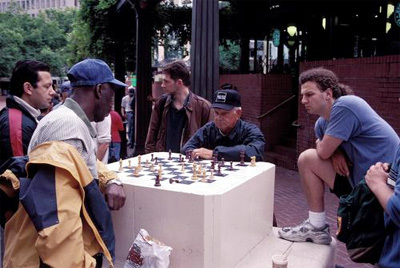 With an effective management organization in place, the square has become the city's place of pride and a focal point for all kinds of community activities. 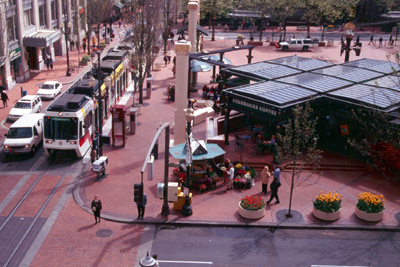 The revitalization of the downtown is testimony to the square's profound impact on the livability of Portland. 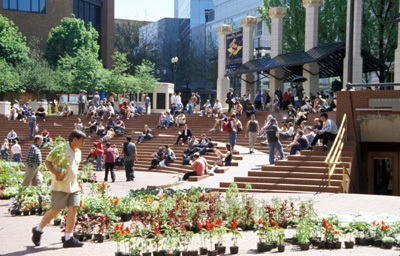 Located in the heart of downtown, Pioneer Courthouse Square—a former parking lot that has since become "Portland's living room"—is a center of activity and important public gathering place for the local community. 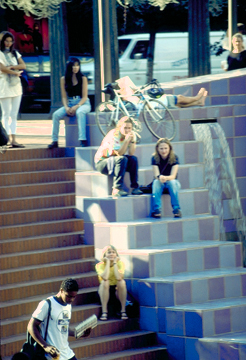 Its modern design includes public art, amenities, flowers, trees, walls and stairs designed for sitting on. The space hosts frequent events, and includes a coffee shop, food vendors, and the information center for Tri-Met (regional Portland's transit agency), which was the key agent of the square's successful redevelopment. It also serves as a hub for buses and light rail.